The doctrine of the fall of man is extrapolated from Christian exegesis of Genesis 3. According to the narrative, God creates Adam and Eve, the first man and woman. God places them in the Garden of Eden and forbids them to eat fruit from the tree of knowledge of good and evil. The serpent tempts Eve to eat fruit from the forbidden tree, which she shares with Adam and they immediately become ashamed of their nakedness. Subsequently, God banishes Adam and Eve from the Garden of Eden, condemns Adam to working in order to get what he needs to live and condemns Eve to giving birth in pain, and places cherubim to guard the entrance, so that Adam and Eve will not eat from the "tree of life". 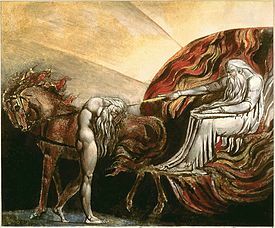 Catholic exegesis of Genesis 3 claims that the fall of man was a "primeval event, a deed that took place at the beginning of the history of man." Traditionally, the fall of Adam and Eve is said to have brought “four wounds” to human nature. These are enumerated by St Bede and others, especially St Thomas Aquinas (STh I-II q. 85, a. 3) They are original sin (lack of sanctifying grace and original justice), concupiscence (the soul's passions are no longer ordered perfectly to the soul’s intellect), physical frailty and death, and darkened intellect and ignorance. These negated or diminished the gifts of God to Adam and Eve of original justice or sanctifying grace, integrity, immortality and infused knowledge. This first sin was "transmitted" by Adam and Eve to all of their descendants as original sin, causing humans to be "subject to ignorance, suffering and the dominion of death, and inclined to sin." Although the state of corruption, inherited by humans after the primeval event of Original Sin, is clearly called guilt or sin, it is understood as a sin acquired by the unity of all humans in Adam rather than a personal responsibility of humanity. Even children partake in the effects of the sin of Adam, but not in the responsibility of original sin, as sin is always a personal act. Baptism is considered to erase original sin, though the effects on human nature remain, and for this reason the Catholic Church baptizes even infants who have not committed any personal sin. Symbolic aspects of the fall of man are commonly taken to correlate with knowledge gained by experience in the wake of fateful decisions. Some of the Genesis 3 narrative's symbolism may correlate to the experience of the agricultural revolution. The serpent of the Genesis narrative may represent seasonal changes and renewal, as with the symbolism of Sumerian, Egyptian, and other creation myths. In Mesoamerican creation myths, Quetzalcoatl, a feathered serpent agricultural deity, is associated with learning as well as renewal. The leading role of Eve in the Genesis narrative may be attributed to the interest of neolithic women in shifting away from gatherer life in favor of raising crops. Women also may of necessity have taken the role of organizers in early farming settlements, thus effectively leading the shift to agrarian society. Though these settlements may have been relatively egalitarian compared to more modern societies, the Genesis narrative may be interpreted as mourning the hunter-gatherer life as a paradise lost. In the novel Perelandra (1943) by C. S. Lewis, the theme of the fall is explored in the context of a new Garden of Eden with a new, green-skinned Adam and Eve on the planet Venus, and with the protagonist – the Cambridge scholar Dr. Ransom – transported there and given the mission of thwarting Satan and preventing a new fall. The theme is also frequently depicted in historical European art. Lucas van Leyden, a Dutch engraver and painter during the Renaissance period, created several different woodcuts featuring Adam and Eve (two were part of his Power of Women series). ^ "Catholic Encyclopedia: Adam". www.newadvent.org. Retrieved 2016-04-12. ^ Kugel 1998, pp. 50–51. ^ Q & A – Original Sin. OCA. Retrieved on 2011-10-30. ^ Eastern Orthodox Catechism, published by the Russian Orthodox Church. Accessed February 16, 2008. ^ "A Metaphysical Interpretation of The Fall of Man". truthunity.net. Retrieved 2017-09-22. ^ "Forum: Has anyone else noticed the correlation between the Garden of Eden creation story and the Agricultural Revolution?". rationalwiki.org. Retrieved 2017-09-22. ^ "Worst Mistake in the History of the Human Race". livinganthropologically.com. Retrieved 2017-09-22. ^ Mulligan, Buck. "Adam and Eve and The Agricultural Revolution". theleagueofnerds.co.uk. Retrieved 2017-09-22. ^ "The creation myth is about the agricultural revolution". community.beliefnet.com. Retrieved 2017-09-22. ^ Mason, Robert T. "The Divine Serpent". native-science.net. Retrieved 2017-09-22. ^ Briggs, Austin. "Quetzalcoatl". austinbriggs.com. Retrieved 2017-09-22. ^ Weaver, Sandra. "Quetzalcoatl is Deeper Than Just a Mayan Story or Myth". 2012-spiritual-growth-prophecies.com. Retrieved 2017-09-22. ^ "How adam and eve went from hunter gatherers to artificers of fine gold and brass". the-fringe.com. Retrieved 2017-09-22. ^ "Tree of knowledge". thanksalwaysreturns.net. Retrieved 2017-09-22. ^ Shenfield, Stephen. "Driven from Eden? Reassessing the Neolithic Revolution". stephenshenfield.net. Retrieved 2017-09-22. ^ Olsson, Tord; Özdalga, Elisabeth; Raudvere, Catharina, eds. (1998). Alevi Identity: Cultural, Religious and Social Perspectives. England: Routledge. pp. 214–215. ISBN 9781135797256. Moon, Sun Myung (1996). "Exposition of the Divine Principle, Chapter 2: The Human Fall (translation), p. 53". Divine Principle at www.unification.net.